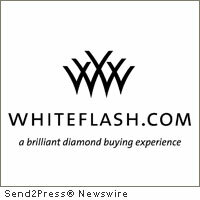 HOUSTON, Texas, Sept. 9, 2011 (SEND2PRESS NEWSWIRE) — With the momentum and rhetoric starting to build for the looming 2012 national elections, Whiteflash, leading retailer of ideal diamonds and fine jewelry, has decided to host their own democratic election. By casting your vote between two top engagement rings in their collection, you will be entered to win one for yourself. Fun, fresh and engaging, the Whiteflash “Give it the YES Vote and Win” is so simple even the technologically challenged can do it. All you need is Facebook and an opinion! The current contest, which positions the elaborate and intricate “Elena” diamond engagement ring against the bold and majestic “Magnolia” engagement ring setting, is like the modern day clash of heavyweight candidates. In the blue corner, you have the 18k white gold “Elena” from the Greek word meaning “splendor of the sun,” with a retail value of $1,795. She weighs in adorned with an impressive 56 A CUT ABOVE® Hearts and Arrows diamond melee (0.50ctw; F/G VS). In the red corner is the equally impressive 18k white gold “Magnolia” diamond engagement ring with a retail value $2,195, and named after the Magnolia flower- the pride of the South. She weighs in with 16 A CUT ABOVE® Hearts and Arrows diamond melee (0.60ctw, F/G VS). It is not an easy choice by any stretch of the imagination, as both settings are extremely popular and exemplify the dichotomies that exist in every modern day woman-strength and femininity. After counting the votes on October 15, 2011 a drawing will be held among those participants who voted for the winning design. One lucky voter will be rewarded with the winning setting. So, throw your vote into the ring (pun intended), and let your voice be heard. The political process has never been more brilliant!